We all have areas of our lives that we’d rather avoid. Sometimes we play the avoidance game because a task or responsibility makes us uncomfortable. Perhaps it will involve working with people you don’t especially enjoy or digging up old memories that still hold some pain. It feels easier to avoid the issue. Sometimes we avoid because we are overwhelmed by the complexity or extensive nature of a project, like cleaning the basement storage room, for example. There’s just so much stuff in there from decades of living. Where do you even start? I have a little kitchen timer that has become my very good friend. I use it daily! Right now it sits beside my rebounder and times me every morning so that I get in my minimum required exercise. 🙂 In the past, I’ve kept that timer on my desk. When I needed to get a dreaded task done, I set the timer for 15 or 20 minutes and plowed into the task for that length of time. Often, I’d get into a groove and end up finishing the work after the timer sounded, but if I wasn’t feeling it, I gave myself permission to quit when I’d completed the prescribed time. Using this method pushed me to make some progress on tasks that I didn’t really want to do. Try it! It works for cleaning house too! Sometimes it’s best not to let yourself procrastinate a task. Put your least fun project at the top of the “to do” list and tackle it first while you are rested and fresh. When I apply this method, I often find that I push through the less desirable task because I’m eager to get to the more enjoyable items on my list. In addition, I don’t have that item hanging there taunting me all day either. Getting it done first and early lets me release the mental burden of the task, gives me a sense of accomplishment, and frees me up in more ways than one to go on with my day and be fabulous! We humans love to be rewarded and get “treats.” Recognize this aspect of your human nature and use it to motivate you to accomplish tasks you need to get done. Assign a reward to those tasks you would rather avoid. For example, if I finish my cleaning chores, I can reward myself with a chocolate bar. If I check off every item of my “to do” list by 6:30 pm, I can take an hour-long bubble bath before bed. You get the idea. The rewards don’t have to be elaborate or expensive, just enticing to you. So make your “to do” list, then write an appropriate reward beside the items you aren’t really looking forward to. Give yourself that incentive to get them done, then enjoy the reward when you check them off your list. Sometimes it helps to get things done when you have to give an account to someone else. Find a family member, friend, or peer who is willing to serve as an accountability partner to you. Get together at the beginning of the week and talk over your goals. You could talk on the phone, via Skype or FaceTime, or exchange emails. Then check back at the week’s end to give a report. I belong to a group of writers. On Monday, we post a list of our goals to the group. On Friday, we give an account. I hate admitting I failed, so I always work extra hard to meet my goals. Knowing you will have to admit to your accountability partner that you procrastinated or avoided an important task is often enough incentive to get you moving. It works for me! Find someone who is on the same journey or has the same mission as you and walk the road together. When I needed to lose weight and get in shape, I found a friend who wanted to do the same. We went to aerobics class together several times a week, encouraged each other to find ways to add fitness to our daily schedules, and ate healthy together. We both lost weight and got in great shape, and we had FUN. We kept each other accountable and motivated by sharing the journey. Do you have a friend or family member who could share your journey? Give them a call and agree to inspire one another! Sometimes we make the excuse that we don’t have enough time, so we give ourselves permission to procrastinate. Grab a notepad and keep a log of how you spend your time each day. Record what you’re doing every 15 minutes or so. After a few days or a week, have a look at the record and take account of where your time has been invested. Do you see any trends? Did you spend hours on Facebook every day? Did you zone out in front of the TV every night for three hours? Were you really too busy, or did you spend time in ways that allowed you to avoid your responsibilities? Sometimes coming face-to-face with the facts of how you spend your time will motivate you to make more productive use of your time. Fact of life: if the job is fun, you are more likely to get it done. So make the not-so-fun tasks a little more enjoyable. I hate cleaning house, but if I can put my favorite tunes on my iPod and listen to upbeat music while I work, I find the task much more enjoyable. I stay motivated and energized for longer. In my work, I create pretty printable planners and calendars to make my “to do” lists more fun to look at. I have a pile of smiley-face stickers that I put next to each item on my list that I complete. I know it’s juvenile, but I REALLY like putting stickers on my list, and I like seeing the list fill up with stickers by the end of the week. It makes me feel good, and that’s enough motivation to push me to get my work done. I have found ways to make unenjoyable tasks more fun. You can too! Sometimes you really are pressed for time, and you can’t get it all done. Have you considered automating some of your tasks? Technology allows us to put a number of chores and responsibilities on autopilot. Paying bills, for example, is easiest when automated. I write maybe one check a month now. The rest are paid on schedule, and the accounting aspect is scheduled as well through Quicken Scheduled Transactions. Spend a lot of time sorting emails? Why not automate that? Most email programs allow you to set up rules to sort your emails into folders. I love getting emails from Bed, Bath & Beyond and my favorite clothing stores because they have great coupons in them. But I hate sorting through them every day to get to the important emails. I set up a system to have my coupon emails sent to their own folder, and I only look at them when I plan to go shopping. I have notifications from Twitter and Facebook sent to their own folders, etc. Many companies will autoship your favorite products that you use daily. I have had vitamins, essential oils, and my favorite shampoo delivered to my mailbox for me so I don’t have to take the time to purchase them each month. If you can have basic tasks done for you, why not? It takes a few minutes to set up the automation, but in the long run, you’ll have more time for the important stuff. Nothing motivates me like a deadline bearing down on me. When I find myself using all my super-powers to avoid a task, sometimes it’s best just to set a deadline and force myself to meet it. Decide on a date for your garage sale and schedule ads in the newspaper. Now you have to have a sale that day because people will be there! Put a deposit down for a table at an upcoming craft show so that you have to finish all those projects in your craft room. Invite relatives to come stay a week at your house, and now the guest room will have to be painted and organized for their stay. A deadline applies the pressure you need to break the procrastination cycle. When all else fails, just force yourself to take the first step. That’s the hardest part. At times I feel like I’m standing on the edge of a cliff. The next step is scary. The outcome is unknown. I’m afraid to take the risk. In those times, I just take a deep breath and jump. Once you’re committed, you figure it out. Overcoming the fear of that first step is the hardest part. Each step after that seems a little easier. By the end of the journey, you’re laughing at yourself for being so hesitant in the beginning. So what are you waiting for? 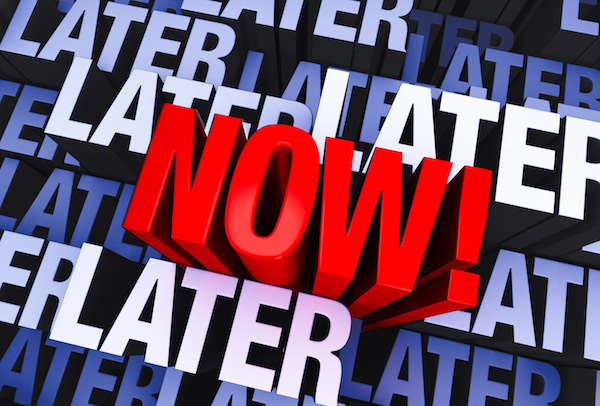 Are you ready to kick the procrastination habit and start getting stuff done? I know you can! I love seeing people succeed! Send me an email with your success story and be an inspiration! Still feel like something is keeping you from making progress? I might be able to help you identify exactly what that is!